We counted more changes in this movie than we did in Insurgent. This is the case of The Scorch Trials movie vs. the book. 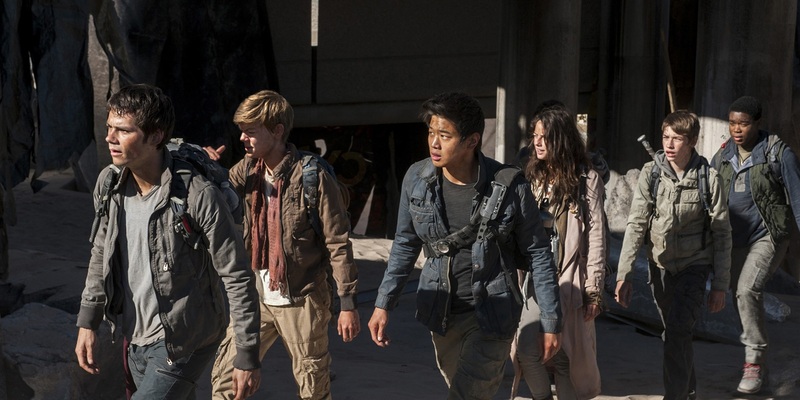 We know you’re thinking it: They changed A LOT of things in the Scorch Trials movie! Is this becoming a trend in YA movies? While Thomas and the other gladers encountered the cranks and WCKD grunts as we expected, their journey is very different than the ones we see in James Dashner’s books. We counted them for you and were surprised to see how drastically they changed the story! We counted more changes in this movie than in ‘Insurgent‘. The Scorch Trials Movie Poll: What did you think of the movie? Here are all of the Scorch Trials movie differences! 1. There’s no Thomas-Teresa telepathy. This change was introduced in the first film. Thomas and Teresa are supposed to be able to communicate telepathically. However, when the filmmakers began outlining the first movie, they decided that they weren’t going to include this story line in the movies. In The Scorch Trials, this connection between Teresa and Thomas is pretty important, but it’s completely absent in the movie. 2. The gladers’ rescuers are never hanged. After waking up to a bunch of cranks, Thomas and the rest of the gladers find their rescuers from the first book dead. Their dead bodies are hanging from the ceiling. In the movie, this entire plot is omitted. Instead, the rescuers are quickly revealed to be part of WCKD. Like Thomas and Teresa, Aris and Rachel are supposed to have a special telepathic bond. However, Aris informs the gladers that Rachel was killed during the maze trials. In the movie, Rachel makes a very brief appearance. Aris recognizes her hanging body. She’s one of the people that WCKD is trying to harvest a cure from. 4. Janson–a.k.a. Rat Man–is a prominent character in the movie. In the book, Rat Man (his real name isn’t yet revealed) is only at the beginning of the story and is there to charge the gladers with their next task: survive the Scorch. In the movie, Rat Man becomes one of the main two antagonists and spends his time chasing the gladers through the Scorch. 5. The Scorch is supposed to be the next trial. 6. The gladers aren’t infected with the Flare. In order to motivate the gladers to complete the Scorch Trials, Rat Man explains to them that they’ve been infected with the Flare and that a cure awaits them at the end of this phase. In the movie, however, this doesn’t exist at all. The gladers are healthy and immune to the Flare (or most of them, at least). 7. There are supposed to be more gladers in the group. In the movie, the group that escapes WCKD is made up of seven individuals. In the book, however, they’re a much larger group. 8. Teresa isn’t avoiding Thomas. In James Dashner’s version of The Scorch Trials, Teresa is upset about something. She tells Thomas that he and the others need to stay away from her. She isn’t present very much after that. She spends her time communicating with Thomas telepathically, pretending to betray him. She’s actually working with WICKED and Aris. In the movie this doesn’t happen. In the books, the cranks are living at various stages of insanity. Most of them don’t want to tear peoples’ flesh off. Jorge is supposed to be a crank and Thomas and the others are able to talk and have conversations with him. In the book, this is completely the opposite. The cranks are straight out of ‘World War Z’. There’s no talking to them. You’ll be eaten alive. 10. Winston isn’t supposed to be killed by the Flare. Winston doesn’t get attacked by a crank in the book, although he is attacked by a molten metal ball. He does, however, die–but he doesn’t die because of the crank bite. Rather, when the gladers are running away from the lightning storm, he’s supposed to disappear, assumed to get struck and die. In the movie, Winston kills himself in order to avoid becoming a crank. 11. Nobody dies in the thunderstorm. Speaking of that thunder storm, seven gladers are supposed to be killed off during this sequence. However in the movie, Minho gets struck by lightning and survives. The Right Arm, the organization fighting WCKD, plays a huge role in the movie. The gladers’ main motivation is to find them in hopes of escaping their past. But like it was already said, the book has the gladers racing across the Scorch for a cure. The Right Arm doesn’t make an appearance until The Death Cure. 13. Jorge isn’t a crank. Like it was said earlier, Jorge is supposed to be a crank in the book. But in the movie’s he’s completely healthy and is dedicated to making sure that Brenda doesn’t catch the Flare. What’s more is that the community that Jorge lives in is supposed to be full of cranks. In the movie, Jorge mentions that the people they live with are mostly from gangs who have wandered in to seek refuge. 14. Jorge and Brenda help the gladers escape. This was a very large addition to the plot. In the movie, one of the men living in Jorge’s community calls in WCKD, hoping to sell the gladers back to them. Jorge and Brenda help everyone escape and then blow up their shelter. In the book this doesn’t happen at all. The original version has the gladers eating dinner with Brenda when the roof caves in and Thomas becomes trapped with Brenda. 15. Thomas never gets shot. Thomas and Brenda do get tricked into entering a sketchy club in the book. However “Blondie” essentially kidnaps them and plans to keep them. It isn’t until the Gladers come and rescue Thomas and Brenda that they’re able to leave. As they try to escape, Blondie shoots Thomas. The wound becomes infected and that eventually leads Thomas into the hands of WICKED. In the movie, Jorge comes to the rescue and then interrogates Marcus about the whereabouts of The Right Arm. Thomas never ends up getting shot and thus never falls into the hands of WCKD. In the book, after Thomas becomes infected, WICKED finds him and takes him into a berg–a sort of aircraft that they use to get around. They want to heal Thomas. While this is happening, Thomas overhears someone mention that him getting shot wasn’t part of the plan, suggesting that something about their experience has been staged. They eventually take him back to the rest of Gladers. This entire plot is non-existent in the movie. 17. Group B isn’t supposed to be friendly. Again, another major Scorch Trials difference. Like in the movie, the book shows us that there were multiple groups of teenagers in the maze. However a major plot line didn’t get translated into the film. In the book, Thomas and his friends were in Group A. Aris, on the other hand, was in a maze filled with girls–Group B. While in the Scorch, Group B approaches Group A and attacks them. Teresa is with them. Thomas ends up being capture by them. After deciding not to kill him, they move forward hoping to get to the end of the trial. Group B is hardly in the movie. Only a few of them make an appearance, like Aris who’s present during the entire movie. Teresa does, in fact, betray Thomas in the book. But it’s very different from the movie. In the book, Teresa reveals that she’s been working with Aris and that they had been in a romantic relationship before the maze. They then force Thomas into a gas chamber. After Thomas passes out, Teresa then reveals that she was being forced to betray Thomas by WICKED and that it was all part of their larger plan. However Thomas is having a hard time buying it. This is the point in which Thomas loses his romantic feelings for Teresa. Like we said before, the Right Arm isn’t supposed to make an appearance in the movie. However the movie leads up to the gladers catching up with the rebels and preparing to leave for a safe haven, away from WCKD. Before they can leave, Teresa betrays them by contacting WCKD with their coordinates. Of course, this isn’t in the book at all. In the book, when the Gladers reach the “safe haven”–the place where their cure is said to be waiting for them–they encounter large monsters created by WICKED. After this ordeal, WICKED takes the Gladers (along with Jorge and Brenda). The book ends there. Ava Paige never appears in the books. She’s referenced several times throughout them, but the Gladers never encounter her. In the movie, she becomes the main antagonist and is present when WCKD attacks the Right Arm. All of that leads up to a huge ending fight that doesn’t appear anywhere in the books. It results in WCKD capturing the Gladers. Just as they’re being loaded into the aircraft (berg? ), Thomas grabs hold of a detonator that Jorge built. He threatens to blow everyone up. WCKD isn’t expecting this. Their shock gives the Right Arm and the Gladers just enough time to fight back. In the fighting, Minho is electrocuted and knocked out. WCKD takes Minho and retreats into their airship with Teresa by their side. The movie ends with Thomas declaring that he intends to save Minho by taking down WCKD and killing Chancellor Paige. Were these even the same stories? WHAT DID YOU THINK ABOUT ALL OF THE CHANGES? LET US KNOW IN THE COMMENTS!